In 2012 through 2015, the Bureau of Land Management (BLM) and U.S. Forest Service (USFS) were working on revisions to resource management plans in 11 states aimed at bolstering the conservation of greater sage-grouse. Meanwhile, the U.S. Fish and Wildlife Service (USFWS) was considering listing the sage-grouse under the Endangered Species Act. Was BLM and USFS going to require mitigation for impacts to sage-grouse when the species was not listed as endangered? Would they develop their own mitigation guidance for sage-grouse? Would sage-grouse soon be protected as an endangered species? How would potential mitigation requirements impact the economy and culture of Nevada? These were a few of the many questions that kept Jim Lawrence – Deputy Director of the Nevada Department of Conservation and Natural Resources – up at night. And he wasn’t alone: ranchers, industry and other stakeholders throughout the State of Nevada were weighing these same questions. The sage-steppe ecosystem makes up nearly two-thirds of Nevada and is critical to wildlife like the sage-grouse that depend on it. However, ranching, mineral extraction, energy production, and public infrastructure are also vital to Nevada’s economy. Could the state find ways to strike a balance between community resiliency, economic stability, and preserving and enhancing the natural environment? Compensatory mitigation – restoration, enhancement or in certain circumstances preservation of natural resources for the purpose of offsetting unavoidable adverse impacts from development elsewhere – is often held up as a tool for striking such a balance. 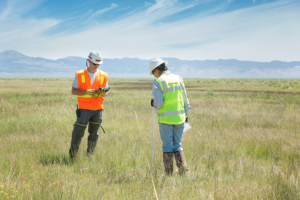 However, Nevada stakeholders were also keenly aware that compensatory mitigation often fails to deliver the desired benefits to the species and creates significant burden to industry through permitting uncertainty and delays. Perhaps new innovations and approaches to this tool could prove successful for the State. As Lawrence often says, one of the most important aspects of the program was designing a system that worked for Nevada. The Sagebrush Ecosystem Technical Team visit a pilot site enrolled in the Conservation Credit System. Photo provided by Environmental Incentives. Although there was significant uncertainty related to federal agency action, Nevada did not wait to see what BLM, USFS and USFWS would do. Instead, through executive order and legislation, the State developed a 9-member Governor-appointed Sagebrush Ecosystem Council to oversee development of a state sage-grouse conservation plan, created a 5-member interagency team to implement the plan, and created a vision for a state-wide mitigation program (the Nevada Conservation Credit System) that would result in net benefit for sage-grouse from human development. To demonstrate action and respond to federal agency planning timelines, the State designed the Nevada Conservation Credit System in 12 months. Using a Habitat Quantification Tool that incorporates the best available science, a single metric was established to consistently measure the impacts (debits) and benefits (credits) to sage-grouse habitat. This habitat metric incentivizes permittees (entities seeking permission to develop infrastructure on public land) to avoid and minimize impacts to valuable habitat, helps site and design mitigation projects to maximize habitat benefits, and ensures that impacts of human development are fully offset by mitigation. The State also developed detailed guidance to ensure mitigation is additional and durable, and to create certainty for permittees and mitigation providers that use the Conservation Credit System. Initiating the Conservation Credit System development took bold leadership from Governor Sandoval and agencies across the State. It was developed through a public process involving the Sagebrush Ecosystem Council, a technical review group of leading scientists, and collaboration with BLM, USFS, USFWS and other stakeholders. Implementation of the program, which included pilot testing in 2015 and continuously improving the program through an annual improvement process, required continued leadership by the State. “It continues to be an iterative learning process as more projects enroll in the system, we gain experience and the science is continuously evolving. We just completed our third annual round of improvements to the Conservation Credit System, and the improvements have significantly increased the effectiveness of our program, as well as the trust of key stakeholders,” said Kelly McGowan, Manager of the Sagebrush Ecosystem Program. Mitigation is not a new concept, but there are particular aspects of this system that are innovative and delivering results for sage-grouse, industry and western culture. Traditionally, permittees on public lands conducted their mitigation on public lands. However, low elevation late brood-rearing habitat (mainly wet meadows) is the most limited and valuable sage-grouse habitat in the State, and most of it is on private land and valuable for livestock grazing. 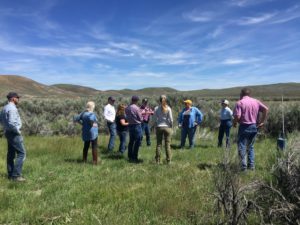 To enhance and protect this critical habitat the Conservation Credit System enables mitigation on private land with compatible land uses including sustainable grazing, creating a new revenue opportunity for private farmers and ranchers. To date, there are more than a dozen mitigation projects on private land with credits available for sale or currently in the process of generating credits. To further prove the mitigation model and stimulate mitigation project demand, the State appropriated $2,000,000 to support landowners through a revolving fund. To maximize the impact of this public funding, the State designed an innovative pay-for-performance strategy to seed-fund habitat improvement projects. Once a mitigation project sells credits to a permittee, the mitigation provider must reimburse the State, allowing the State to re-invest the funding in future projects. The profit opportunity for mitigation providers comes from maximizing the credits generated from a single project, thus encouraging cost-efficiency and optimal habitat created for the sage-grouse. Field verification of habitat at Tumbling JR Ranch. Photo by Stantec Consulting Services, Inc. The Conservation Credit System is based on a relatively new mitigation mechanism called a habitat credit exchange in federal policy. A habitat credit exchange is a programmatic approach to mitigation that can reduce administrative costs and ensure a mitigation standard (e.g. net benefit) is achieved when there are many credit and debit projects. Several mitigation programs based on the habitat credit exchange mechanism exist; however, the Conservation Credit System’s first transaction in November 2017 is also the first transaction using this new mechanism in the country. The habitat-function based metric used to determine mitigation obligations and mitigation benefits incorporates landscape-scale and site-scale attributes to create project siting and design incentives for both debit and credit projects. In addition, the use of this single metric for both debit and credit projects enables the Conservation Credit System to ensure net benefit from human development, and report net benefit at the project and landscape-scale. When working at the landscape scale, it is increasingly important to find ways to balance community resilience, human development, and conservation; compensatory mitigation is one tool to navigate the balancing process, and the innovations of the Nevada approach demonstrate that increasingly sophisticated applications of such tools may be tremendously beneficial in the coming years. 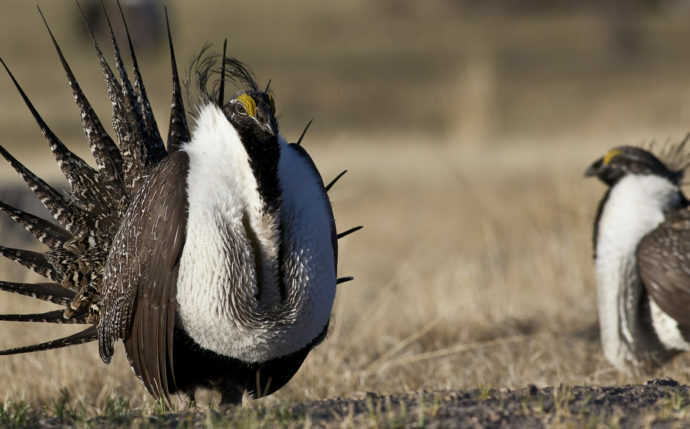 While generating mitigation using the Conservation Credit System may be costlier than status quo mitigation, industry is demonstrating interest in the mitigation program because it ensures net benefit for sage-grouse, increases mitigation certainty and streamlines permitting. Kinross Gold Corporation, operator of Bald Mountain Mine, completed the first sage-grouse mitigation transaction in November 2017 encompassing 9,750 acres of high-quality sage-grouse habitat. Although the Conservation Credit System reduces the subjectivity typically involved in status quo mitigation, McGowan works tirelessly with permittees to help them understand how to maximize the benefits of using the Conservation Credit System, including how to reduce their impacts to sage-grouse and corresponding cost of mitigation. About the author: Eoin Doherty is the Wildlife & Land Practice Lead at Environmental Incentives and assisted the State of Nevada with the design and implementation of the Conservation Credit System. Eoin has helped numerous public conservation funding and compensatory mitigation programs maximize their effectiveness using Performance-Driven Conservation® tools and practices. “Soft Skills” – What are they really?